The Holiday when we become the Torah's "Dancing Feet"
Immediately following the seven-day festival of Sukkot comes the two-day festival of Shemini Atzeret and Simchat Torah. (In the Land of Israel, the festival is "compacted" in a single day). Shemini Atzeret means "the eighth [day] of retention"; the chassidic masters explain that the primary purpose of the festival is to retain and "conceive" the spiritual revelations and powers that we are granted during the festivals of the month of Tishrei, so that we could subsequently apply them to our lives throughout the year. The "Four Kinds" are not taken on Shemini Atzeret. We still eat in the sukkah (according to the custom of most communities), but without making the special blessing on the sukkah. On the second day of Shemini Atzeret (i.e., the ninth day from the beginning of Sukkot)--and in the Land of Israel—we go back to eating in the home. The second day of Shemini Atzeret is called Simchat Torah ("Rejoicing of the Torah"). On this day we conclude, and begin anew, the annual Torah reading cycle. The event is marked with great rejoicing, especially during the "hakafot" procession, in which we march, sing and dance with the Torah scrolls around the reading table in the synagogue. "On Simchat Torah," goes the chassidic saying, "we rejoice in the Torah, and the Torah rejoices in us; the Torah, too, wants to dance, so we become the Torah's dancing feet." Other festival observances include the special prayer for rain included in the musaf prayer of Shemini Atzeret, and the custom that all are called up to the Torah on Simchat Torah. 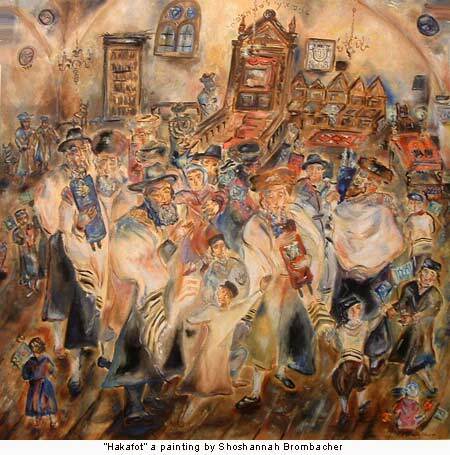 Image by chassidic artist Shoshannah Brombacher. To view or purchase Ms. Brombacher’s art, click here. FLAGS AND CANDLES In the UK lighted candles are no longer permitted as a fire risk and new health and safety regulations. far fewer apples are now seen on the top of flags as the flag poles are weak plastic and have no extension above the now plastic flag top. Flags and Candles "It is customary for the children to carry flags with lit candles during the Hakafot." (Yalkut Minhagim) Reason: In accord with the verse, (Is 24:16): With lights give honor to Hashem." for Sharon Sharon, I am happy to be a woman and to be raising my children. It still makes me sad that in Orthodox shuls I don't get called to the Torah for an Aliyah and that in most the women don't dance on Simchat Torah.